Bel Canto was founded twenty-five years ago by John Stronczer. John’s expertise in audio electronics and his passion for live music steered him towards creating the most engaging musical experience possible. Every Bel Canto product begins with a high level idea that goes through in-depth research, extensive development and multiple proof-of-concept stages. From the elegant e.One series to their ground-breaking new Black, Bel Canto provides a wide range of products that focus on recreating the live musical experience in your home. They bring together the latest technology and user-friendly operation with beautiful, minimalist aesthetics. We had always been impressed with John and his whole team at Bel Canto: they are kindred spirits and our companies share so many of the same values. We are proud to offer their products and we hope you are as excited by them as we are. The new Bel Canto Black is like no other audio system in the world. It is a uniquely-integrated three chassis system that maintains signal source accuracy in the digital domain to the analog amplification section without loss or coloration. Beautifully constructed from solid high grade billet aluminium, the modern look and feel of Black connects to all sources offering the highest level of flexibility and ease of use. Black creates an authentically present and naturally dimensional musical experience that will captivate you. Available as a three box system as well as a single box integrated unit, Black provides a truly elegant system that will fit in with any décor while still providing the very highest audio performance. 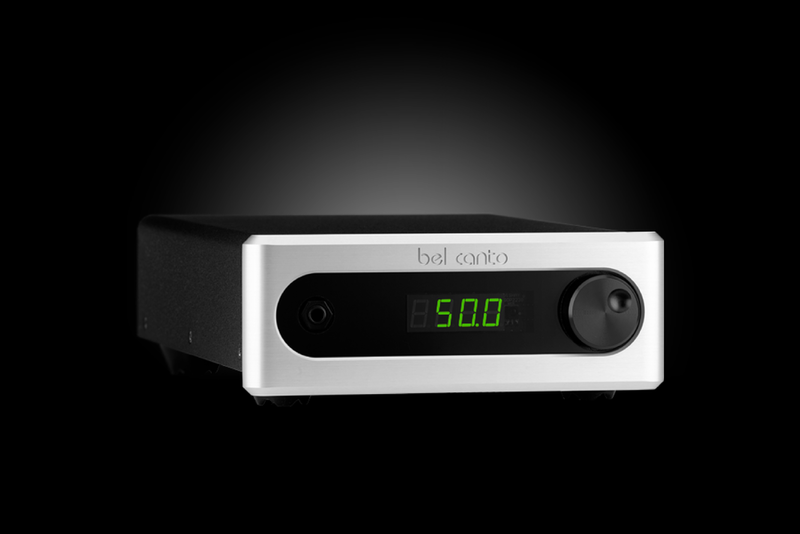 “The Bel Canto Black was the most transparent system I've ever heard, period. The most spectacular aspect of it was the nature of the stereo image… the Bel Canto Black ascended to a new level that was unfamiliar. The overlaid planes disappeared completely to make way for continuous three-dimensional space… Each instrument had its place as though it were truly present. e.One components range across source components, DACs and amplifiers. At each price point they offer truly exceptional performance. Independent chassis separate power from the focused DAC function, creating a pristine environment to process signal revealing incredible detail and audio resolution. With a class-leading 126dB dynamic range and a 24 bit volume control, you’ll hear deeper into the recording than ever before. “Through the innovative technologies designed into these products - the bar has been raised in terms of overall performance and increased listening pleasure. Incredible audio performance, features, and flexibility, the DAC2.7 provides 124dB dynamic range and a 24 bit volume control with a sound that is musically open, detailed, and natural. Designed with the same core building blocks as the high-end Bel Canto DACs, the DAC1.7 offers 122dB dynamic range and a 24 bit volume control, with a musical, clear and detailed sound with excellent features. The REF600M monoblock provides serious power, delivering the pure treble of Class A, the slam of the best Class D architectures, and the mid band presence that brings your music to life. From an elegant, cool-running compact chassis, it provides 600W into 4 ohms and 300W into 8 ohms. The REF500S stereo amplifier has incredible power per square inch with two independent mono boards in a single chassis. Independent power supplies and isolated input signal filter technology reduces high power amplifier energy for a cleaner, transparent power. From an elegant, cool-running compact chassis, each channel provides 500W into 4 ohms and 250W into 8 ohms. The refined integration of the C7R DAC Integrated Amplifier has features that enhance both operation and performance, designed with REF power filtration for a more musical and detailed sound. With five digital inputs including USB, line and phono inputs and even an integrated FM tuner, all sources are covered. A high quality integrated DAC supports up to 24/192 and 24/96 on USB. A dedicated headphone output stage complements an integrated power amplifier providing 150W into 4 ohms and 75W into 8 ohms. The C5i Integrated Amplifier is simplicity and musicality in one compact chassis that controls all of your sources, is versatile, and easy to use. With five digital inputs including USB, line and phono inputs, all sources are covered. A high quality integrated DAC supports up to 24/192 and 24/96 on USB. A dedicated headphone output stage complements an integrated power amplifier providing 120W into 4 ohms and 60W into 8 ohms. The CD3t CD transport provides the most direct digital path to your DAC with a convenient slot load drive. With a high quality CD transport driving SPDIF and AES/EBU digital outputs, it provides a low jitter, maximum quality source to drive your DAC. “I highly recommend the CD3t for those looking for a high grade transport to match with a quality DAC. High performance asynchronous ultra-low phase noise audio renderer connects your computer or NAS networked music server through Ethernet to your audio system. UPnP/DNLA compatible and supporting data rates up to 24/192 it provides an exceptionally low jitter, bit perfect data source for streaming music to your DAC. High performance asynchronous ultra-low phase noise USB link connects your computer to your audio system with complete isolation from your computer source. Providing what we believe is one of the highest quality digital audio outputs from a USB source, the combination of ultra-low phase-noise clocks and a minimal noise internal power supply ensure an exceptionally clean, low jitter digital output.